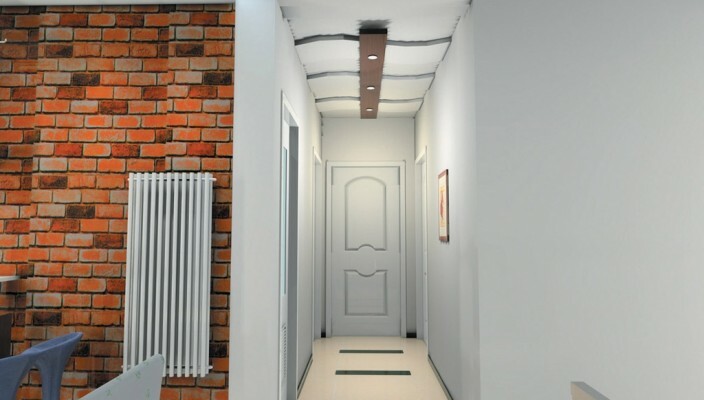 The brick wall effect in this house interior design stands out with the corridor theme. Grey walls adorn the main stretch. The ceiling in the corridor has wooden panels for the focal lights. The flooring is a mix of uniformed tiles that create a structured balance. On the wall is a painting which is ideal because a bare wall is just that bare – paintings showcase a story! To the left of the corridor we have the brick wall creative house interior design. A small window with simple venetian blinds adds to the color scheme of the room. Basic furniture compete the effect with no over the top feel at all. To the right of the room is a banister taking one downstairs making this design apt for a duplex apartment or an independent home. Focal illumination throughout the entire house interior design indicates that lighting for every angle has been well planned.